After our adventures in Jordan, we headed over to Istanbul on a very annoyingly timed 3:30 a.m. flight, which left us with no sleep for the night and brought us into Istanbul so early in the morning, we had to wait about 5 hours for our hotel room to be ready. In our waiting time, we had breakfast at our hotel, Hotel Tashkonak, on the rooftop patio, and took a short walk through Sultanahmet, the old part of the city where the Aya Sofia, the Blue Mosque and plenty of the other tourist sites are. Then once our room was ready, we slept the rest of the day. Once we were well rested, we started exploring Istanbul in earnest. We started out with the Little Aya Sofiya, which is a pretty church-turned mosque with a graveyard surrounding it and a pretty domed roof. Then we visited the tomb of a bunch of sultans, which we happened to come across. All their individual grave markers/sarcophagi were standing like little houses under a domed roof. 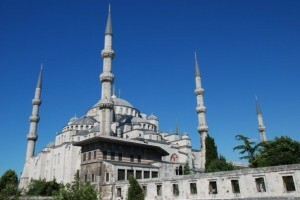 Next we went to the Blue Mosque, or Sultanahmet Mosque, which is one of the most beautiful sights in the area. It has soaring minarets, domes everywhere you look and a lovely courtyard and garden. Inside it looks like a pretty standard mosque, though it does have some nice tile work, with mostly blue floral designs on the tiles. I’m glad I bought a head scarf when I was in Egypt so I didn’t have to use a loaner. 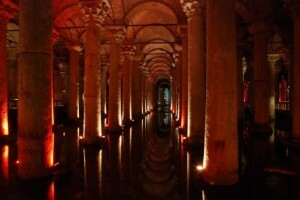 We couldn’t go in the Aya Sofiya, which is right across from the Blue Mosque, because it’s closed on Mondays — we explored it a few days later — so we headed across the street to the Basilica Cistern, an ancient roman cistern with a hodgepodge of columns taken from across the city and a vaulted roof. There were some carp swimming around in the water, and in the far corner, there were two columns whose bases were upturned Medusa heads. The theory as to why one is on its side and the other is upside down is that the Romans, being Christians, meant to show that they were just using the blocks as building materials, not worshiping false idols. Continuing our super-tourist day, we went to Topkapi Palace, a huge complex for the sultans and their families. The treasury had an interesting collection, with lots of rubies, emeralds and diamonds, and there were some very elaborately tiled walls in the harem. It was also neat to learn about the palace’s history, complete with scheming concubines, murdered princes and the sultan’s mother ruling the roost while the sultan walked around in silver-soled shoes. We also walked around the hippodrome, which isn’t much to see, except for two obelisks, a column and a fountain. It functions more as a pedestrian thoroughfare and makes a pleasant place to stroll. We decided to head out of the city for a day to explore the Princes’ Islands, a set of 9 Islands in the Sea of Marmara where people from Istanbul keep summer villas. The only transport allowed on the small, hilly islands are bicycles and horse cards, though there are some motorized vehicles allowed for the police, garbage men, etc. We went to the biggest of the Islands, which we got to by ferry, and got some ice cream straight away, since it was a hot day. Then we started our walk to the monastery up in the mountains, which ended up being more of a church than a monastery, but maybe we missed something. The walk was really lovely — the big houses had huge gardens, and because of all the trees, we had lots of shade. 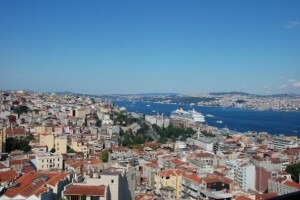 There were also great views of the sea, the other islands and Istanbul. When we finally got up to the monastery area, we had a nice lunch, explored the small Greek Orthodox church where people had left little trinkets, like watches and jewelry, in hopes that their prayers would be answered. There were also lots of white bags, papers and cloths tied to the trees and bushes on the path leading up the hill, which apparently also symbolize prayers. We woke up to rain for the first time on our trip, but by the time we had breakfast and set up a lunch date with a friend who lives in Istanbul, it had stopped. Before lunch, we decided to tour Aya Sofiya, which is much more impressive from the inside than the outside. Outside, it looks old and staid compared to the blue mosque, but inside, it’s all gold and there are some incredibly detailed mosaics in its gallery. It would have been amazing to see it in its original glory, with its large open spaces and soaring dome, which were unfortunately obstructed for us by scaffolding put up for reconstruction work. By the time we were ready to leave, there was a thunder-and-lighting storm raging outside, so we ran to the nearby tram stop, getting soaked in the process, and trammed and funiculared to Taksim to meet our friend who took us out to a lunch of traditional Turkish food. We had dishes like “The Imam Fainted,” a tasty cold eggplant dish, dolmas, stuffed peppers and pureed eggplant. I also had Turkish coffee with dessert — strong and bitter as expected. It was time to see something of contemporary Istanbul, so we went to the Istanbul Modern, a great museum that showcases Turkish modern art. We were introduced to plenty of talented artists we’d never heard of, and toured the temporary “Design Cities” show, which showcased important works from cities that influenced popular design over the years. The museum also has a fantastic cafe overlooking the Bosphorus, though it seems like just about every restaurant in Istanbul has some sort of water view, which is always a nice touch. The rest of the day’s tour included a trip up Galata Tower and down the Kamodo Steps. We thought we might avoid it because of our crazy experience at the bazaar in Egypt, but we ended up going to the Grand Bazaar and the Spice Market anyway, and boy were we surprised. It wasn’t crowded, the shopkeepers didn’t hassle us too much, and the shops had some really interesting and colorful items. We also went in to a bunch of mosques, though at this point they all started looking a bit the same. We had a nice relaxing day of sleeping in, then sat at a tea garden eating ice cream and baklava and playing checkers for most of the afternoon. Evan beat me every time. We went to tour Dolmabahce palace — another home for the sultan’s, though newer than Topkapi and in a European style. The grounds were beautiful, with manicured gardens, fountains and little ponds with lily pads and an expansive view of the Bosphorus. Touring the interiors of the buildings, though, we needed to go as a group with a guide. The groups were pretty big, and the palace’s big rooms echoed and made it hard to hear our guide. We also kept running into the group ahead of us. Still, the building was impressive, with huge chandeliers, carved ceilings and a lot of trompe l’oeil painting. Touring the harem, our guide did a better job, though we had some rogue tourists who kept arguing with her and trying to strike out on their own. After getting lunch at a vegetarian restaurant near Taksim, we took the metro to Levent to go to the mall. The Kanyon mall was huge, modern and gorgeous. It’s an indoor-outdoor multi-level space with posh shops, curving walkways and a spherical movie theater. We shopped a bit and saw Hancock — with an intermission that included commercials (not cool to interrupt a movie so abruptly like that and then make us watch even more ads!). Lazy day lounging at the hotel, researching Thailand and reading. We ordered in food with the help of the super-nice staff at the hotel and spent a lot of time using their free lobby computer. It was time to get out of the city again and go on a Bosphorus tour. We caught the ferry at Eminonu and took it up to Anadolou Kavagi, where we climbed up a hill to a ruined castle, where we had great views of the Bosphorus and the Black Sea, which were both a tranquil turquoise blue. When we got down from the mountain, we caught a bus down to Kanlica where we had a strait-side lunch featuring the town’s delicious yogurt, which really was better than any of the yogurt we had elsewhere in Turkey. We watched plenty of ships passing by and even saw a dolphin. By the time we were done with lunch, it was too late to visit any of the other sites we’d hoped to get to — just about everything around Istanbul closes at 4 or 4:30 — so we hopped on another bus to Uskudar, then took the ferry back to Eminonu. We walked along the coast back to our hotel, passing swimmers and sunbathers on the rocks (there’s no beach there). One of Evan’s brother’s friends who we’d met for drinks earlier in the week played tour guide for us all day. She brought us to a Greek Orthodox neighborhood where we visited a church and an impressive large high school on top of a steep hill. We also toured Bosphorus University, which as its name suggests has some beautiful views, then had a long and relaxing lunch at a waterfront cafe in Ortakoy. We spent the rest of our day in Istiklal, hanging out in a cafe reading while avoiding some rain, then going out for a makeup birthday dinner, since in Jordan we never had one, at a rooftop restaurant. With our flight to Thailand in the evening, we had one last day to spend in Istanbul and I knew what I wanted to do — go to a hammam/Turkish bath. Evan didn’t want to come, so he went on his own errands while I headed to the Cemberlitas Hammam, right near the Grand Bazaar. The Hammam dates back to the 1500s, and the men’s side is supposed to be grander than the women’s, though it was still a neat experience. The main bathing room has a warm raised central platform, where most of the activity takes place. I started out relaxing there in my bath sheet while others were getting bathed around me, staring up at the small circular skylights in the pink domed ceiling, and soon an attendant came in to give me my bath. There was lots of water, soap and scrubbing with a loofah mitten. There was also a bit of a massage and I also had my hair washed in an adjacent alcove. The most surprising part of the experience, though, was that the attendants don’t really wear much clothing. Like only bikini bottoms. The guide book did not prepare me for that — I thought I was the only one who was going to be exposed. Well, I chalked this one up to being an interesting cultural experience, and I despite some initial anxiety, ended up enjoying myself and feeling squeaky clean and relaxed by the time I was done. Evan and I spent the rest of the day relaxing at the Dervish Tea Garden, drinking tea and playing backgammon. I won every time. When it was time to finally leave, we had a nice time at the airport, hanging out in the Turkish Airways lounge, which was really nice (we somehow managed to fly business class to Thailand — our longest flight!). There was a business centers with computers to use, a big dining/drinking area, a separate kids’ room, a TV lounge and a sleeping lounge. The flight itself was fine — we both slept most of the way — though Turkish Airways has the worst business class food I’ve ever had, worse than most economy meals I’ve had. There were at least huge TVs, and on their flight monitor, we could check out the front and rear views from the airplane — it was quite cool to see it approach the airport and land! Check out our Istanbul photos in Evan’s Facebook album.